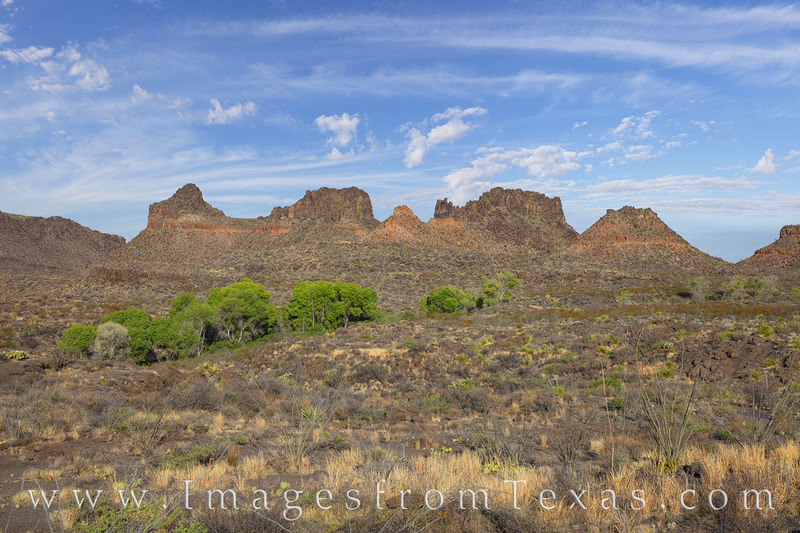 Big Bend National Park is one of my favorite places in Texas. 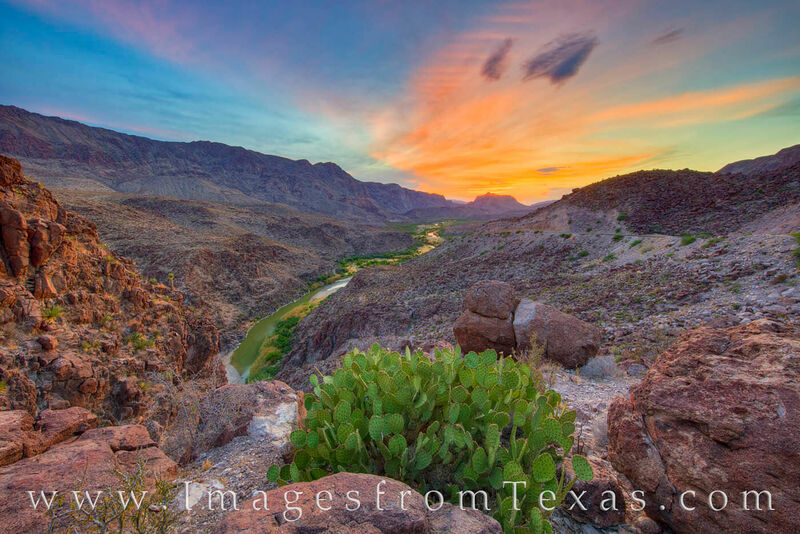 Just to the west of this region is the oft overlooked little brother – Big Bend Ranch State Park. I’d wanted to explore this largest state park in Texas for quite some time. My first trek to “the other side of nowhere” happened about 8 weeks ago in early February. That brief excursion left me wanting to see more. My wife and I spent some time along FM 170 between Presidio and Lajitas exploring some of the trails there, but I wanted to return and visit the interior. To accomplish this, I needed some things to fall into place. First, my wife was tired of making the long drive to the Big Bend area, so I needed to gain permission from her to head out for a 3 day trip while she took care of the home front. She agreed, mostly, I think, so she could stay home. Next, I had to find a friend who could take time off and who enjoyed exploring because when I’m camping, I’d rather have someone around to share in the discomfort. So I asked a friend of mine to come along. While he goes by a different name, we’ll call him Bob for this story. And on Friday morning we met at 7am at the Whataburger in Fredericksburg (he came from San Antonio and I departed from Dripping Springs) and were on our way. Bob is a photographer, as well, though he doesn’t practice professionally. However, he does excellent work and knows what he’s doing, is willing to get up at 345am and stay out late to get the best shots, and likes to experience new places. I had been watching the weather for 2 weeks, even though I realize how unreliable a forecast is until you’re in the 48 hour zone. And even then the forecast looked sketchy with regards for sunrises and sunsets being colorful. Our plan was to drive the interior of Big Bend Ranch State Park (BBRSP), check in at the Sauceda Ranger Station, then set up camp not far from our trailhead destination. Sometimes plans don’t work out even when you think they did. Everything went as accordingly as far as we knew, as we passed through Fort Stockton, Alpine (had lunch at “Come and Take It Barbecue”), then on through Presidio, then down the 27 mile dirt road to the Sauceda Ranch House. The ranger who was on duty, Kirsten, was quite helpful and full of information. Soon, we had claimed La Posta as our campsite, only about 5 miles from the Fresno Canyon Rim trailhead. The remainder of the afternoon was spent photographing some of the local cacti blooms and waiting until sunset (and hoping for good color in the sky). On a recommendation from Kirsten, the ranger, we drove the very bumpy 4WD Osa Loop to a lofty clearing. “You’ll know it because all the grass will be flat because the cows lay down up there.” And sure enough, after bouncing and rattling up something that resembled a dirt road, we found the place where the cows lay down. The views were ok, too, but not spectacular (maybe I’d been spoiled from Big Bend National Park). As sunset approached, Bob and I found ourselves on this hill that had nice views in both directions. The sky was not offering much hope for color, so we reluctantly made the decision to drive the 4WD high clearance road back to the main dirt road, then back to camp. About 5 miles from the campsite, the sun peeked through the clouds right on the horizon, and we scrambled to capture the moment. We scurried up a small rocky slope and shot for a short time. I had decided to run back to the car to change lenses, but a rock reached out and grabbed my foot, sending me into a headfirst dive. But I saved the camera (that was the fleeting thought as I hit the ground). A quick check showed I had blood oozing out both hands, and elbow, and both legs. The sun was setting quickly, so the blood could wait. As I type, I have wound on both hands and legs from rock-puncture wounds that caused a fair amount of bleeding. Nevertheless, I still recovered in time to enjoy an unexpectedly colorful pink and blue sunset. 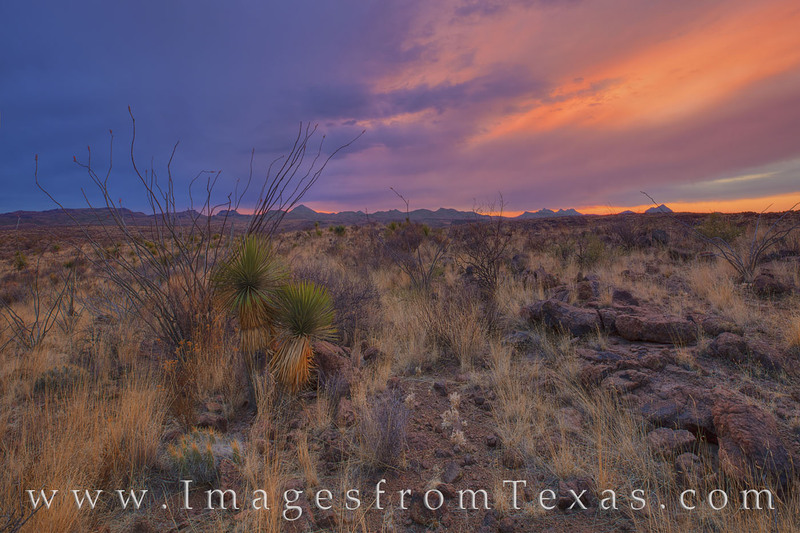 From the interior Big Bend Ranch State Park, the sky lights up on a spring evening. Clouds had dominated the entire day, and we’d all but given up on any colors at sunset. Then, as quickly as a ghostly wind, the sky suddenlly lit up in pink and orange for about one minute, then was gone as quietly as the solitude this park offers. With yucca and ocotillo in the foreground, this image was taken west of the Sauceda Ranch house just off the main park road. This sunset was an unexpected surprise. Back at camp, we hunkered down for a rough night. Bob retired to his tent. I chose to stretch out as best as possible in the back of my 4Runner. I feel safe saying it was one of the worst nights of sleep I’ve experienced in quite a while, so it wasn’t that difficult getting ready at 3:45am and driving out by 4am. By 4:20am we had found our trailhead, having only missed one turn. The trail to the rim of Fresno canyon is about 2.6 miles (GPS indicated we covered 2.59 miles) and was well marked – or so we thought. Hiking in the light of a full moon was a pleasure, and we even stopped to shoot the distant mountains as they glowed in the dim light. At one point we even witnessed a meteor streak across the sky. Amazingly, the green trail it left in the night sky glowed for at least 30 seconds. It was a pretty cool thing to see, for sure. Continuing on, we arrived at the canyon rim in a little over an hour – much earlier than we’d planned. How did we get here so quickly? I guess we were fast walkers in great shape. So we waited another 45 minutes until the first glow of orange appeared in the east, then spent the next hour trying to capture those moments of beautiful light at a remote place that few Texans have ever seen – and so many more don’t even know about. It is here that I am embarrassed to say we had not reached the canyon. I admittedly was underwhelmed with the “canyon” that stretched out before us. It was on the smallish side and out of curiosity, I had walked halfway down and back up in the dark. Little did I know at the time, if we had kept going – down and back up – we would have come to an amazing sight. The realization that came a few days later still makes turns my stomach in knots. And my obsessiveness about getting the best shots takes over. And I’ve already started trying to figure out when I can return and take care of this unfinished business. After all that, we still had a nice sunrise… just not the dramatic views we had expected. But at the time, we didn’t realize our failure, so we were content. Fresno Canyon cuts through the desert in this remote region of BBRSP, and from our ravine only a quarter mile from the canyon, we got a taste – a partial view – of the Solitario and flatirons. When I visit places like this, I’m always interested in hearing stories about the first settlers. I really can’t imagine attempting to forge out a life in this arid south Texas place. Water is scarce, vegetation is angry and always ready to prick you with tiny spears, and food sources are not abundant. One of the only graces about this harsh environment is that it rests at over 4,000 feet in elevation so the temperatures are often cooler than those along the Rio Grande only miles away. So with work finished for the morning, we departed. It is always fun to hike in the daylight after the original hike takes place in the dark. The landscape is no longer hidden and mysterious, and the colors, textures, and formations become reality. Everything looks different when you add a little light. The trail to and from the Frenso Canyon Rim looks a bit different in the day. We had hiked this area in the dark, but on the return trip, the areas where water collected showed off vibrant green in an otherwise dry, rugged, arid desert landscape. The wash where these cottownwood trees thrive leads to an area known as Mexican Falls. Back at the car, we inched our way back to the main dirt road, stopped to buy a few stuffed animals for my daughters at the ranch house, and took our time to stop and photograph various places on the way back to FM 170. The dirt road that leads to the Sauceda Ranch House rattles on for 27 miles, and further after that. Heading east, after the first 10 or so miles, the views are incredible and filled with interesting rock formations, the Bocifillas Mountains, hoodoos, and more. The vistas over each hill and around each curve make this bumpy ride a surprisingly pleasant experience. Once our tires hit pavement again (really an underappreciated part of driving), we drove to Presidio, had lunch at the Oasis restaurant (serves a pretty good cheeseburger), then checked into our hotel (the Riata – which despite outward appearance was actually a pretty nice place for cheap – clean rooms and a clean bathroom). For an hour, we rested, then again headed out, this time to photograph probably the most well-known hike in the park, Closed Canyon. I had shot here before, but Bob hadn’t seen it. We met some nice folks from California and Marble Falls along the path, and slowly explored the area between the high rising rock walls that cut through this Colorado Mesa. Finishing at Closed Canyon, we made the decision to head to our final destination of the evening – the Big Hill. This location appears on some maps, but not others. It is a simple pull-out along FM 170 that offers spectacular views of the Rio Grande looking west. About 100 yards east from this pull-out is another pull-out – this one leading to the Dom Rock. Both of these places are easy access, but if you are willing to put in a bit more effort, even better views can be had. We knew the full moon would be rising at sunset, so the plan was to shoot both directions and go back and forth – full moon to the east and setting sun to the west. The sunset turned out to be all we could have hoped for – a sky full of pink, red, orange, and blue pastels. Beneath this colorful palette, the green strip of the Rio Grande wandered west towards the setting sun. More astounding was the fact that we didn’t see another person – or even a car – the entire time we were working. This place really is off the beaten path. I’ll not belabor how beautiful this landscape is, so I’ll just leave this image to show what we experienced. 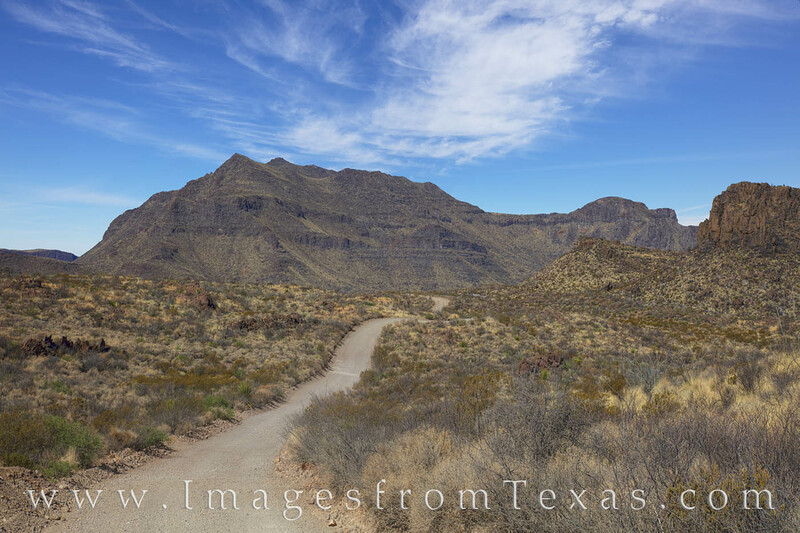 Big Bend Ranch State Park is an undiscovered treasure. Few folks have visited his year, instead choosing to explore Big Bend National Park just a few miles to the east. But for those who do, the views are incredible and the crowds nonexistent. 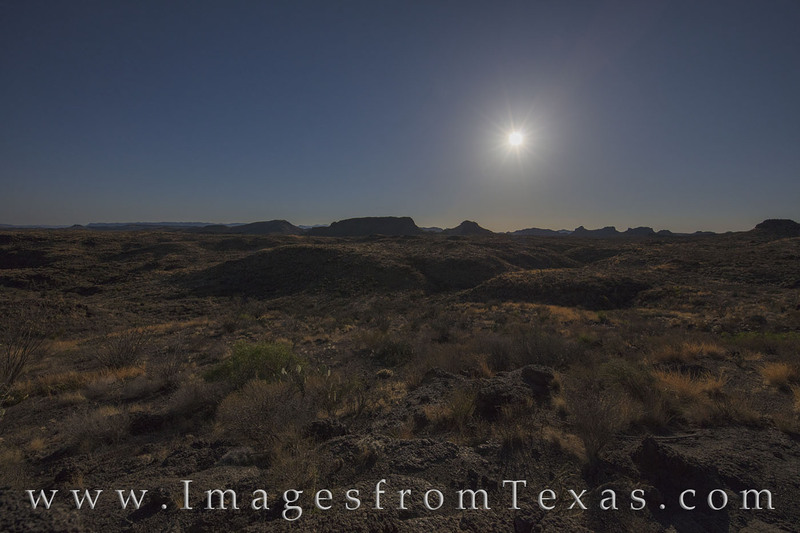 This image comes from a beautiful Spring sunset from an overlook commonly known as the “Big Hill.” From here, the Rio Grande flows east (towards the camera) as it makes its way onward to Big Bend National Park. On the left (south) is Mexico; on the right (north) is Texas. This evening in BBRSP was just about perfect. After wrapping up the evening, we made our way back to the hotel (took about 55 minutes), then returned to this spot the next morning for sunrise. Again, colors greeted us with reds and pinks in the sky, but after a colorful sky, eastern clouds soon took over. To the west, the sky was soft blue and white and pink. The contrast in colors between sunrise and sunset always catches my attention, especially when comparing images from relatively the same locations. From here, the photography part of our trip came to an end, and it was hometime. But not before one more adventure. As we left Terlingua and drove in the direction of Alpine, we made the required stop at Checkpoint Charlie – the area where the border patrol checks cars traveling north. Somehow, their dog make a “hit” on my car, so we were tagged and pulled over. The officers had Bob and I wait in a detention area while they emptied our car. I asked Bob, “Is there anything you want to tell me now?” He said nope, and carried on a lively conversation with the guard who was making sure we didn’t make a run for the… empty, barren landscape that stretched out a hundred miles. We sat there maybe 20-30 minutes while the dog was allowed to sniff around inside our car (all our belongings for the trip had been thrown on the ground). Not surprisingly, the dog found nothing, and avoided the clink. On our way again, made our way through Alpine before stopping at the Dickeys Bbcue in Fort Stockton for an early lunch. After that, it was hometime and hugs for my girls and wife. Yes, it was quite a 3 day tour. Posted in Big Bend Ranch State Park and tagged big bend ranch, big bend ranch state park, desert, FM 170, frenso canyon, lajitas, milky way, presidio, remote, Texas, west texas on May 6, 2018 June 25, 2018 by Rob Greebon.